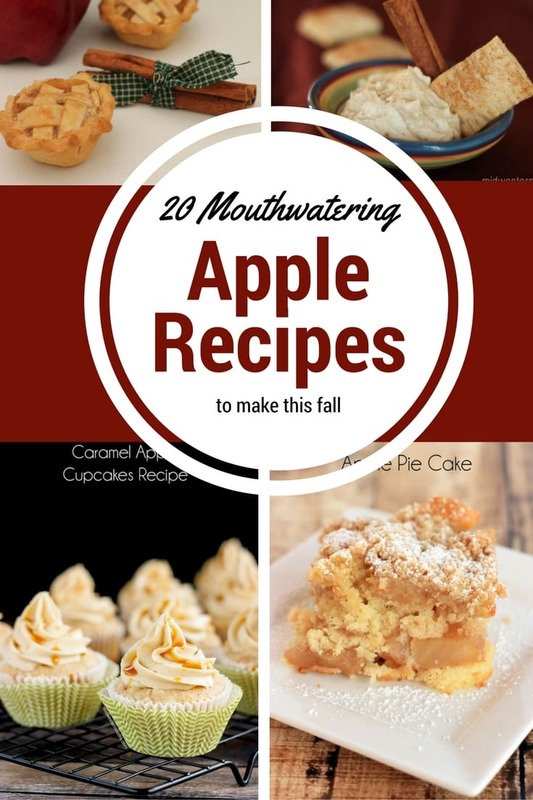 My newsfeed has been filled with upcoming apple festivals, which makes me start craving apple recipes! Each year we try to visit our local orchard to pick apples, as well as sample their delicious apple butters, preserves, and my absolute favorite apple food of all time. . .caramel apples. Most of the time these orchard visits result in us coming home with way too much fruit, and I start browsing for great apple recipes in order to use the apples before they start to go bad. This year, I figured while I was on my hunt, I’d share some with you, too! These were a huge hit with my kids! A delicious fresh apple flavored cupcake with caramel buttercream frosting. What is better than a cake chock full of delicious apples? Nothing. This recipe has the best of both worlds–airy with a bit of crunch. Super easy and extremely delicious. This muffin recipe using snack packs is a hit with kids. Bite-sized versions of the pies that Grandma used to make. These tiny pies made in muffins tins are great for any sweet tooth. Apple filled pastries dipped in a cream cheese mixture. Sprinkle some cinnamon sugar on these and enjoy! Apples and oatmeal always pair nicely. Can’t you just look at these and smell fall? These large, fluffy cinnamon rolls would be awesome to make for a brunch with friends. I can almost smell this cooking in my kitchen. Finish it off with some whipped cream and caramel drizzle. I could curl up by the fireplace with this drink. The perfect way to use up orchard apples is to make up a pot of fresh apple butter. Cheesecake bars in an hour? Yes, please! These look simple, and super tasty. Beautiful presentation of a delicious dessert! These would be amazing topped with homemade ice cream. First of all, this is a combination of my two favorite things in the universe. Secondly, all the taste of pie without all the trouble of making pie crust. I love it! Monkey bread was always a special treat made on Sundays in my house growing up. Check out this delicious caramel apple version! Yum! There is some work that goes into these doughnuts, but by the looks of it, it’s well worth it! The glaze. . .mmmmmmmm. These treats on a stick look like something that would go over well at a party. They may also be good to individually wrap and give to guests. Now, these are my type of dipping snack! Step 1, make the apple butter. Step two, turn into something you can slather on ribs. I’m very interested in trying this recipe out! Apple salad is a great way to work apples into mealtime. Best part of this recipe is that it only takes 10 minutes to make! Make apple pie filling this fall and save for your holiday baking needs! This recipe is also clean-eating friendly. Crescent rolls made into a pastry braid. An excellent presentation idea for your homemade apple filling. Now that your mouth is watering, which recipe do you think you’ll try making first?